The Rounds-Clist Construction Company was one of the major general contracting firms in the region and facilitated the constructed of many large scale building projects around the state. The partnership had been formed between E. J. Rounds (1865-1929) and Walter Mark Clist (1880-1952) in 1918 and continued for nearly 30 years. Founder Edgar J. Rounds was born in Crawford County, Wisconsin on May 27, 1865. Educated at an unknown business college in Madison, Wisconsin, after learning the carpenter trade, he was employed as a foreman for the Chicago & Northwestern Railroad. He then took a job as the construction foreman for the N.O. Nelson Manufacturing Co. complex in St. Louis, Missouri (1890), at the time, one of the largest wholesale manufacturers and distributors of plumbing supplies in the United States. For reasons, unknown he relocated to Seattle in 1891 and began working as a general contractor for the firm of Pickarts & Company. Later he formed a short-lived partnership with Charles L. Ditlefsen. The Rounds & Ditlefson construction firm focused mainly on residential construction. Known projects are limited to the J.T. Williamson House (1900); the E.C. Fitzhenry House (1900); the Dr. D.A. Mitchell House (1900); and a mattress factory in West Seattle (1900). By 1905 Rounds and Ditlefson had parted ways; each establishing their own general contracting firms. Projects during this time period by Rounds include the First Methodist Church (1908); the Queen Anne Fire Station; Columbia City Schoolhouse; Minor Hospital; the Stewart Hotel; Wintonia Hotel; Northern Pacific RR roundhouse and shops (at Handford St & Occidental Ave, 1917); Gaffney Warehouse (c.1905); and the Holden Warehouse. A $150,000 contract to build the seventeen acre J.F. Duthie & Co. shipbuilding plant (1918) with buildings covering over three quarters acres of floor space, most likely spurred Rounds to take on an additional partner, Walter M. Clist. Clist was a prolific builder in his own right and was an outspoken advocate for the Association of General Contactors. In fact he was elected head of the Northwest Chapter of the Associated General Contractors in 1922. Clist lectured often on a variety of topics to local civic and social groups on different aspects of the building industry. He was born in London and spent his primary years in Spokane, Washington. Rounds was very active in the Master Builders Association (MBA) and well respected by his fellow contractors. He had been a founding member of the Seattle MBA chapter and was appointed chairman of the committee to organize a regional Pacific Northwest master builder association. When it was formed in 1918, Rounds was elected its first secretary-treasurer. Together the firm made a significant impact on the built environment in the Pacific Northwest. They were responsible from constructing many of prominent civic, educational and private buildings in the region. Projects in Seattle include the Cornish School of Music (1921); the Pacific Telephone & Telegraph Company Melrose Exchange (1921); Federal Reserve Bank (1921); National Bank of Commerce (1921); Roosevelt High School (1922); the Cambridge Apartments (1923); Women’s University Club Building (1923); the Seattle Chamber of Commerce Building (1925), Roundcliffe Apartments (1925); the Medical Dental Building (1925); the Orpheum Theater (1927, destroyed); Suzzallo Library (1927); Nile Temple Clubhouse (1927); and the Paramount Theater (1929). Outside the city, the firm built the YMCA building in Bremerton (1919); a dining hall for Camp Sealth, a Campfire Girls summer camp on Vashon Island (1921, named after E.J. Rounds); an office building & storage building for the Superior Portland Cement Co. (1922) in Concrete; Capital National Bank in Olympia (1923); the Hotel Morck (1924) in Aberdeen; the Washington Building, Tacoma (1925); and the Paulson Medical Center (1929) and Culmstock Arms Apartments (1929) in Spokane. 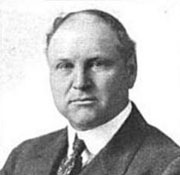 After Rounds’ death in 1929 (May 23), Walter M. Clist continued to run the company under the Rounds-Clist name until he retired and liquidated the company in 1944. Clist then relocated to Laguna Beach in 1943 and died there on August 18, 1952.